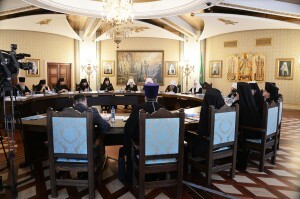 On 21 June 2013, a regular session of the Supreme Church Council of the Russian Orthodox Church, chaired by His Holiness Patriarch Kirill of Moscow and All Russia, took place at the Cathedral of Christ the Saviour in Moscow. ‘Our major theme today is an education reform in the Russian Orthodox Church. Now it is June and school-leaving and entrance exams are in full swing. Both secular and Orthodox higher education institutions, as well as theological schools start their campaigns for attracting school-leavers. It is just the right time for discussing the problems related to the life of our theological educational institutions. ‘I would like to remind you that the Church felt the necessity of reforming the system of theological education as far back as 1990s. This sphere has been changing rapidly and the Church cannot stand aside from these processes. ‘When a future clergyman graduates from a seminary or academy, he does not get into a vacuum or a previous century, but into modern society with its challenges, pace of life, and its speedy information transmission and processing. He should get necessary knowledge and skills in order to not only be a loving pastor (that should be formed in the first place), but also meet intellectual expectations of society. ‘The following words are ascribed to a certain philosopher: ‘Education is a difficult task, and to improve its conditions is one of the sacred duties for each man, for there is nothing more important than education of oneself and one’s neighbours’. The development of theological education, the transformation of our clergy into an ‘intellectual class’ of our society is a sacred duty for us all. It is not for the sake of some intellectual aestheticism but for the sake of making us as participants in public discourse more convincing – all this for the sake of salvation of the soul of the modern man, for whom convincing are only the words which are intellectually impressive. ‘In a secular society, one can sometimes encounter the opinion that our theological education is qualitatively interior to the secular one, that it is too specialized and isolated from modernity, that a graduate of even the best theological academy cannot match a that of a secular university. It is stereotyped thinking of course, formed by certain distrust by a part of society and academic community toward the theological education system. The refusal to see in theological schools full-fledged academic and educational partners is often prompted by ideological considerations. Indeed, we conduct dialogue with only a small circle of scholars, while there are no problems with those who are in dialogue with us. And these stereotypes prevail precisely among those with whom there is no dialogue. I believe it is the unfortunate inertia of the Soviet time, example of which we see on various levels of Russian society. But in the theological education there are certainly objective problems which need to be urgently addressed. ‘Despite the opinions of theological education held by those who are very far from it and who have never held a single theological text in their hands, we need to seek to make our Orthodox institutes, universities, theological schools listed as the best higher education institutions of the country. Our efforts are called to draw near the time when we could claim a place in the global rating of higher education institutions, and this work should be started now without any delay. ‘Theological schools are to be fully recognized by the state and society as up-to-date, competitive developed academic-intellectual humanitarian centers which train not just a cohort of clergy but scholarly educated humanitarians. It is the result that the education reform should lead to. ‘We should not limit ourselves to humanities. Just as for physicists it may prove beneficial to have a knowledge of theology (at least a touch with this knowledge will help destroy the stereotypes of the atheistic past I have mentioned), so the graduates of seminaries have to understand the up-to-date scientific vision of the world, modern achievements in theoretical physics and in many other areas of secular knowledge which have significant philosophical implications in life. ‘A priest is called to be a comprehensively developed person. Indeed, he has to communicate with people of various trades and to know how to speak in their language. Therefore, I believe it important to develop cooperation with natural science institutions of higher education, to invite their professors to read lectures in our schools. On our part, we are ready, too, to comply with respective requests and to read lectures or even courses in universities, including technological ones, which have in interest in receiving the knowledge of modern theological scholarship. ‘Our society expects much from the clergy today, such as model behaviour, high culture of thinking, high culture of the word, the ability to give answers to thorny questions of our life, moral-ethical and social. Certainly, we should not connive at the attempts to create an image of the perfect minister. There are no and will be no such. Priests are human beings and they are prone to mistakes. These are people who have various talents, various abilities, various kinds of knowledge and various levels of education. But if a priest, especially if he makes a public statement, is poorly educated and on top of that seeks to teach all and sundry, society will immediately create a caricature image of him. We do not intend to justify inappropriate behaviour of our fellow brothers but we believe it necessary to do all possible to raise the spiritual and cultural level of our clergy. ‘Our theological schools are precisely the places where the leaven of spiritual life of our society is prepared. In this sense, they have a great responsibility. St. Peter says, ‘Be shepherds of God’s flock… because you are willing, as God wants you to be; not pursuing dishonest gain, but eager to serve; not lording it over those entrusted to you, but being examples to the flock’ (1 Pet. 5:2-3). These God-inspired words should imbue the whole system of our theological education, for its true meaning lies in implementing this instruction’.